PLEASE NOTE: ORDERS FOR ALL DREAM CATCHERS / MONOGRAMS ARE CURRENTLY UNAVAILABLE. SORRY. Our custom made personalised painted wooden words, wooden name signs and wooden letters are perfect for kids, your home decor or your event. Whether you use them to decorate your child's room, a wall in your home or even your wedding, they are sure to make any space personal. They also make fantastic gifts for new borns or even bigger kids. All of our wooden words, plaques and signs are professionally cut here in Australia and are painted with high-quality paint. By shopping with Ollie's Room you are supporting a small local business. 9mm thick words are best for wooden Wall Names to decorate your children bedroom, large toy box and home decor etc. 18mm thick words are what we call Free standing Names. As they stand up, they are perfect to decorate your home, on cupboards, benches, bedside tables, buffets etc. They also make perfect business signs for your market stalls or counters. It can be done as free standing or wall hanging. just let us know at the checkout. The size we refer to is the height of the first capital letter. Hyphen names or joined words that have 2 or more capital letters are classified as 2 words/names order. Please type in 2 into the corresponding box when ordering. Our fun Australian made Engraved Wooden Name Shapes, come in several different designs. These include princess crowns, cars, trains, hearts, stars, butterflies and elephants. 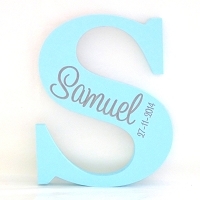 Every shape is personalised with your child's name engraved on it and in the colours of your choice.